Birdfair-2011, originally uploaded by Paradise in Portugal. 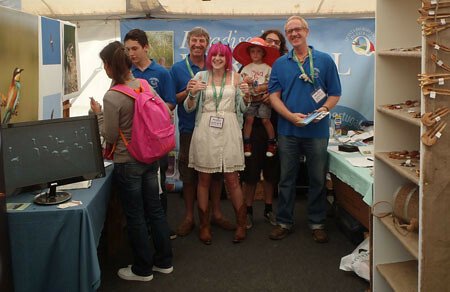 So … another Birdfair done’n’dusted, and what a Birdfair it was! Glorious weather, not too hot nor too cold; pelted with rain the day we set up and pelted again the day afterwards, just right really, so not too hot in the tent, nor too wet and slippery around the fair either … perfect! Our thanks go out also to all those hard-working souls behind the scenes who organised and ran yet another successful weekend. It was a great venue to showcase the Quinta’s new joint venture, “Nature Provides” where we’re going to be promoting jewellery and other accessories made from our local natural products here, such as cork or olive wood. My lecture went well – or so I’m told – but I’d have liked it to be longer so I could really get my message out there that screw top and plastic stoppers in wine are seriously bad for the environment and adversely affect much of Western Palearctic birdlife. In October I’m off to spread the word in Middlesborough and Teeside at two lectures, thankfully longer, for the RSPB groups there, so if you’re in the area please come along. In the meantime, if you drink wine, please make the effort to buy bottles with real corks in them; the birds you see in the future depend upon us making this small, pleasurable, commitment. Not too much to ask is it? Not too much to ask for me to get a move on and announce the lucky winners of this year’s Birdraffle either … but i had them up for a week and nobody claimed, so I’m going to re-draw on Sunday 11th September and the new winners will be posted here from midday that day. Remember that the names will only be up here for the following week so if you were an entrant make sure you pop by during that time. Of course you could always come out here beforehand and see what Paradise is like – you can see what birds we get by visiting our Birding site. We’re keeping the prices the same as this year for any reservations made before Christmas, and there’s a wonderful promotion of 20% for any stay of a week or more, so it’s never been better value for money.